Boxed gang of Kelly Gang including special rules card and bases. Models supplied unpainted. To many locals the Kelly gang are heroes, fighting against a corrupt and unjust system. To others he's a murderer, a common criminal to be loathed. To the authorities he and his gang are to be hunted mercilessly, brought to justice and a short drop and a sudden stop. 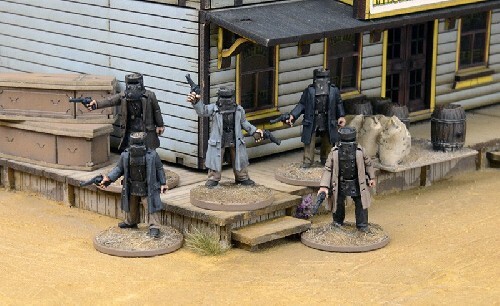 Whichever is true one thing is for sure, anybody who crosses the Kelly gang faces a terrible, almost unstoppable foe.This box set contains 5 Kelly figures, bases and Kelly rules card. Designed to be used with DMH Down Under.